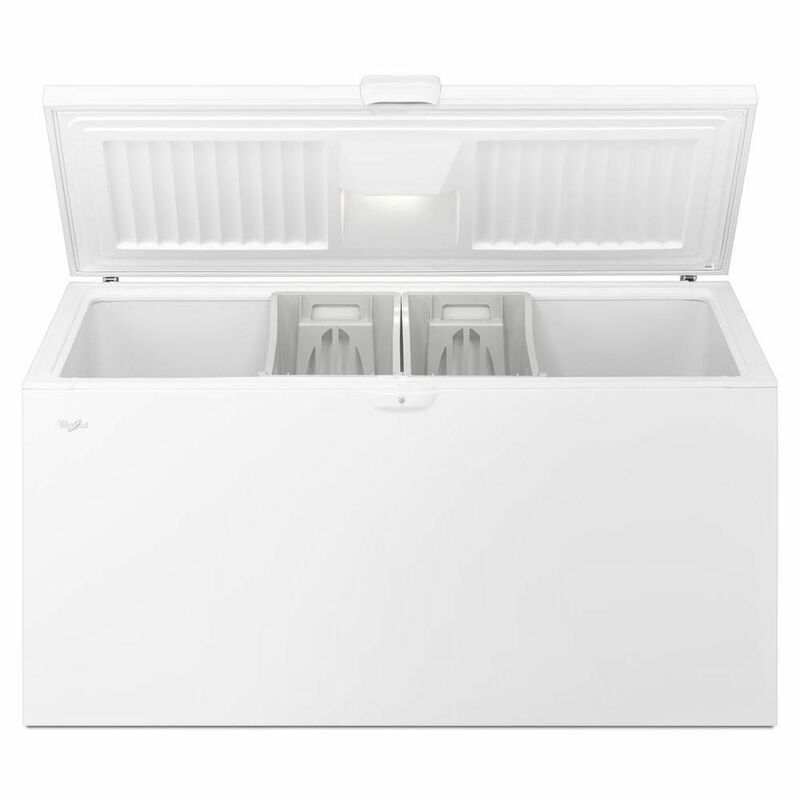 If it’s a ton of freezer space you’re after, the Whirlpool WZC3122DW offers a very roomy 21.7 cubic feet of storage for anything and everything you need to keep ice cold. It comes with three interior storage bins to help keep your stash organized, a key lock to keep others out, and energy-efficient advanced foam insulation to ensure everything stays frozen solid. This Whirlpool also has some thoughtful additions to boost ease of use, including interior lighting, an easy-to-set exterior temperature control knob, an included hose adapter for the defrost drain, and rounded corners that replace hard-to-clean nooks and crannies. It has a white textured finish and a vertical swing door. Owners say this model is reliable and offers a huge amount of extra space, but some caution that you’ll need a lot of extra room in the garage or basement since it’s over 5 and a half feet wide. A few others also say the storage baskets sometimes fall into the freezer cavity. Check out our other reviews of the best chest freezers available on the market today. If you don’t need quite the huge capacity of our top chest freezer, or you simply need something a little more reasonably priced, owners and experts rave about this roomy GE model. It has 10.6 cubic feet of space – still more than enough capacity for a family who likes to stockpile a lot of frozen goods – and it’s Energy Star-certified for efficiency. Features include up-front temperature controls, manual defrost, interior lighting and three sliding, lift-out baskets that help keep contents organized. The freezer can also be locked to keep contents safely contained, and a power indicator on the outside reassures nervous owners that the power is on and freezer is working. This freezer’s temperature can range from -10 to 15 degrees and can be set using the seven-setting temperature gauge. Owners say the controls are easy to use and there’s more than enough room, and very few report reliability complaints. Experts give it top marks for temperature performance, efficiency and noise, and say it easily stays cold during short power outages. Warranty is one year. Forget having to search high and low for your frozen foods or reaching down into the dark depths of your freezer for what you need. Frigidaire's insanely spacious, Energy Star-qualified upright eliminates both of those issues with its 16.6 cubic feet of reach-in storage space that's illuminated with bright LED interior lights. A great feature on this model is its frost-free operation, which saves you the trouble of ever having to defrost it. It also has plenty of storage features that make it an organizer’s dream: Four wire shelves, one removable trivet, and six door racks are included with this model. With its adjustable temperature controls, you can set the unit to the correct temperature for your needs. And when it comes to aesthetics, the simple design marries form and function. The smooth white exterior finish resists fingerprints and smudges, and the super thick “arcticlock” walls keep food frozen for more than two days if there is a power outage. That, combined with its security lock, gives you the ultimate peace of mind when you invest in this unit. If spending a pretty penny isn't in the cards for you when purchasing an extra freezer look no further than this 5 cubic feet chest freezer from Haier. The freezer is flat so it can store easily next to a wall without taking up a lot of space in your home. And while the price is small the size is big — it can hold up to 175 pounds of food! Other neat features are a removable basket to keep frequently used items close together and a defrost drain which makes the pesky task of defrosting mess-free. Reviewers love the size and price. While some have said they wish there was more bins to organize others have taken this into their own hands and added plastic bins to help store foods neatly. One reviewer commented that the machine is so quiet she has to check to make sure it is on. If you prefer an upright freezer that won't take up much space, consider this model from Midea. It's the same size as a dorm-room refrigerator, and offers 3 cubic feet of storage for all your frozen goods. Two wire shelves and a wire basket help you organize your frozen goods, and because it's not too large, it's unlikely that foods will get forgotten in the back. The quiet compressor makes this ideal for any kind of living space. And the reversible door makes it easier to customize depending on your home. This freezer is also available in black or stainless steel finishes. If you need a small freezer for a small space – perhaps in a dorm room, under a desk, on a side table or in tight quarters like a boat or an RV – this basic-black Whynter is an efficient, compact pick, reviewers say. It’s Energy Star-rated and offers 1.1 cubic feet of space, good for keeping a stack of frozen dinners or several pints of ice cream at the ready. At roughly 17.5 by 18.5 by 19 inches, the Whynter won’t take up more than its fair share of space in tight quarters. Inside, it has one removable slide-out wire shelf and a mechanical temperature dial that allows settings from -10 to 2 degrees. The swing door is reversible – handy for spots where it can only open one direction – and there is a recessed handle to keep things streamlined. The door is also lockable so no one can access your frozen stash unless they have the key. Owners love this little freezer, saying it’s a great size for one person who doesn’t need to stock up on a huge amount of frozen goods. They also say it’s quiet enough not to be a bother, even when it’s underfoot. Warranty is one year. You shelled out the cash for custom cabinets and fancy countertops, and now you need a freezer to match your built-in fridge. No problem. Summit Appliance's two-drawer stainless steel freezer has you covered. It fits in a 24-inch footprint under a counter but also can be used as a stand-alone. Frozen food access is effortless with this model that's easy to load and unload; you barely have to bend down to remove items, even when accessing what's at the back of the drawers. The SCFF532D offers frost-free operation with fan-forced cooling for even temperature distribution. As far as organization goes, the unit has a full-width sliding wire basket and two adjustable dividers that let you partition the interior any way you choose. This machine is also self-defrosting, which is super convenient for freezer maintenance.